One of the features of May's release schedule ever since it's become the time to open the summer movie season is its spareness, often with just half a dozen or less movies opening in wide release. That continues this year, with just the fifth new movie three weeks in. This week's entry is the second film in the Narnia series, Prince Caspian. After 2005's The Lion, The Witch and the Wardrobe earned nearly $300 million domestically and another $450 million internationally, Walden Media had its first real hit, and continuing with adaptations of C.S. Lewis's fantasy series were a no-brainer. They occupy something of a middle ground between the Lord of the Rings series and Harry Potter, at least as far as fantasy goes, with them neither as dense literature-wise as Tolkien, nor as gee-whiz-bang as Rowling. The difference hardly matters as far as box office goes, though. 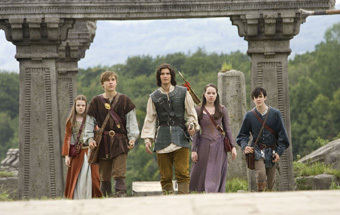 Prince Caspian sees the return of the Pevensies to Narnia, but 1,000 years after the events of the first film. There, they find that a lot has changed, with the kingship in the hands of an evil pretender to the throne. They must find the King's nephew, the titular prince, who is the true heir, using the help of Narnia's magical creatures, including the great lion Aslan. Kids love the dynastic civil war stories, I tell ya. Prince Caspian is a bit more action and battle oriented than The Lion, The Witch and the Wardrobe and seems to be trying for a bit more of an epic feel. The story is a bit lesser known, and it comes in with a slightly lower hype than the first film, with some of the novelty gone. It makes up for that by being more of a known quantity and with a prime release date (though Christmas is more of a natural time for this to release). With close to 4,000 screens, it should see an opening weekend of about $68 million.